Laurie Plissner Archives - Book.Blog.Bake. Grace was the girl who always did everything right, until the night she fell for a boy’s sleazy line and became pregnant. Nick couldn’t care less about pretty math-geek Grace or the baby he fathered. He’s had a dozen girls like her, and he’ll have a dozen more. When Grace confesses to her super-religious, strait-laced parents, they deliver a shocker: They’ve scheduled an abortion. All they want is to pretend this never happened. When Grace balks, they literally throw her out in the street. A rich, elderly neighbor takes her in, and, with the help of the friendship she needs in Charlie, the old woman’s great-nephew, she must make the toughest choice of her young life. The people she believed in were only playing a role, while others, in an unlikely way, are true heroes. Grace can never have the life she planned, but she has one chance to be the person she will have to live with for the rest of her life. Her choice will cost her, big time, either way–and no one can make it except her. It’s very rare that I completely dislike a book so much I don’t recommend it at all. The majority of my one and two star reads are books that I realize are not for me, but will have appeal for several readers. 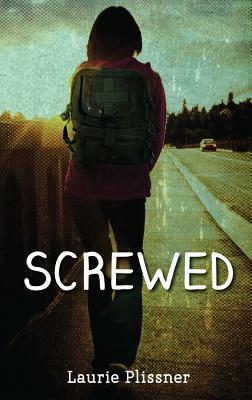 Unfortunately, Screwed falls in that unfortunate small category of books that I actively dislike. Grace’s parents are shown to be polite, conversative, involved citizens of the community and the church who are only in it for a good reputation. They act hypocritical, illogical, and unbelievable for parents. At times Grace’s parents think that they actually hate their daughter a little bit. Now, I know there ARE parents out there who don’t love their kids, but it’s such a jump for them. They go from doting on Grace to actually using the word “hate” towards her, at least in their minds. There’s two main boys in the book: Nick, the boy who Grace has a fling with, and Charlie. They’re meant to contrast each other, but . . . Nick’s goal is to get twenty girls to sleep with him, and it’s pretty obvious that Nick sees women and girls as nothing more than an means to an end for him. He goes into an adoption agency and almost all he thinks about is how attractive the owner of the agency is! Again, he’s an exaggerated stereotype. Charlie is suppose to be the “nice” guy but even though he has good intentions, his actions towards Grace still seemed a little. . . off to me. He thinks he has to protect her and protect her honor. Well-meaning, perhaps, but it still makes Grace seem like a fragile girl who can’t be trusted with her life and her choices. With one refreshing exception of the guidance counselor, the only other teacher and principal in this book is sadly characterized. The teacher tells an entire class of student that THEY ARE ANIMALS. She says this. To a room full of high school students who probably have insecurities and problems and you know, probably don’t enjoy being called animals. And who clearly aren’t animals. And then she claims it’s all because they’re playing video games. . . sorry, I just don’t follow the logic. Even if teachers would think those things, I don’t know a single teacher who would say it out loud. The principal can’t bother to care and is just looking forward to retirement. This will probably make my review ridicolously long, but it needs to be expanded more than what I just touched on underneath my impression of the characters– Charlie. Let’s get something straight, because this is a pet peeve of mine in YA. If you think you’re a “nice guy”, but if you can’t respect the fact that the girl you like is pregnant and is going through a lot of things, you are not a “nice guy”. If you think you’re a “nice guy” but also feel the need to defend said girl who is by no means defenseless(Grace may have made a bad choice, but she’s shown to be a smart character. She can handle her own), you are not a “nice guy”. The plot itself is quick-moving, if predictable. Even though I feel for Grace, I feel she had it pretty easy after getting kicked out of her house. She’s taken in by a wealthy benefactor and besides dealing with kids at school, doesn’t have to worry about much. I’m sure it would be really hard to be in her position, but overall things could have gone much worse after being kicked out of her house. Also, this book is written in third person unlimited omniscient, which is really not a good fit for the book. I don’t need to know what a jerk Nick is because I can see inside his head as well as the main character’s — show me instead(which, to be fair, is shown quite frequently with great intensity). I don’t need to know everyone’s innermost thoughts. I would have appreciated Screwed more if the point of view had stuck with Grace and Grace alone. I really didn’t follow the plot as well as I could have because I was so distracted by all the characters and their portrayals. Even Jennifer, Grace’s best friend who supports her for the most part, is an annoying character. She says whatever she’s thinking and does seem to harbor quite a bit of judgement towards Grace. All in all, I just didn’t feel this subject was handle with the nuance and care it so deserved. It read very much like an after school special, and I was just hoping for something deeper. Final Impression: A predictable plot filled with characters who’s only purpose seemed to be to embody a stereotype. Nobody is off the hook from this treatment, and it was just impossible to read past that. The most enjoyable part of the book was after Grace delivers her baby and has a few months without being surrounded by the other characters. It seems to be the only time any character growth really happened and overall, I just was hoping for more from this book. 1/5 stars.